Want some cookies for a special occasion? Christie Cookies has special gift tins filled with their delicious cookies. And best of all, July is PATH Intl. month! 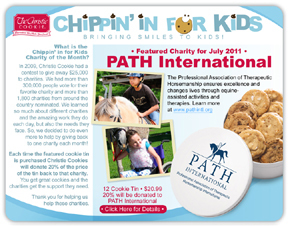 During July, every time the featured gift tin is purchased, Christie Cookies will donate 20% to PATH Intl. You can't beat that! Click here for details. Hello World, Meet the Professional Association of Therapeutic Horsemanship International! In the next few editions of PATH Intl. eNews, we will explore the content of the association's new name and tagline. Today let's look at the word "association." It is a universal truth that there is strength in numbers. PATH International's mission is to promote excellence in equine-assisted activities and therapies. We uphold that mission through instructor certification, center accreditation, educational opportunities and being a voice for EAAT. None of us could do that alone. Alone we couldn't identify and refine disciplines and activities to help nearly 43,000 men, women and children participants. Alone we couldn't develop and field test standards to promote safety in the industry. Alone we couldn't certify over 3,500 instructors nor count nearly 800 centers worldwide that uphold PATH International's standards. PATH International - the Professional Association of Therapeutic Horsemanship International - is the total of the active participation of its members. Each member brings to the association skills, talents, knowledge, expertise and enthusiasm, and all of that is shared with every other member. Because of our size (nearly 8,000 members worldwide) we are recognized as an expert in the EAAT field. We are looked to for safety standards, and our influence is felt at many different levels, from each parent looking for a respected and trusted therapeutic center for her child, to those in the medical field considering therapeutic horsemanship for their patients; from the person with a love for horses who wants to be an instructor to the center who hires him because he is certified by PATH International. Through an international association, standards are developed and field tested, and PATH International is recognized as a leader for safety in the EAAT industry. Those standards are reviewed by you, our members, and are updated yearly so that those who benefit from our services know that our certified instructors and centers can be trusted to provide them with the highest quality of therapeutic horsemanship. In addition to the standards, professional development is stressed. Offering continuing education through workshops and conferences, including the upcoming international conference, shows the association's commitment to lifelong learning and a recognition that we as professionals stay current in our field. Being a member of an association also provides networking opportunities. Through opportunities to volunteer at either the center level or on committees, members can network with peers across the globe. This proves a great resource for any future research, job opportunities and information sharing. If you haven't yet been to a conference, the 2011 PATH International Conference and Annual Meeting is the best way to start building your network of peers. Regional Conferences are a wonderful venue to exchange best practices. All of these are benefits of belonging to an association that represents your professional interests: The Professional Association of Therapeutic Horsemanship International. Look for PATH Intl. Strides Magazine and Conference Registration Book in Your Mail! We're excited that the 2011 PATH International Conference and Annual Meeting registration book is in the mail. You will be able to see the great session line-up we have prepared for you and begin deciding which networking events you would like to attend. Of special interest will be keynote speaker Phil Tedeschi, the Big Lex Exhibitors Bash, the annual awards banquet, the Horse Expo, which will be held at the beautiful Kentucky Horse Park, and The Mane Event closing reception. Leif Hallberg, MA, LCPC, has been hired by PATH International to consult with the organization in the role of Communities Coordinator. She will be working on creating a new membership program for association members. Leif is also a licensed clinical professional counselor (LCPC) in private practice in Bozeman, MT. Leif has been a member of PATH International since 2006. She previously served on EFMHA's board from 2007-2010. She is currently serving as the volunteer chair of the EFP/EFL Membership Task Force. Leif is the author of Walking the Way of the Horse: Exploring the Power of the Horse-Human Relationship. The responses to our new name have been overwhelmingly positive. 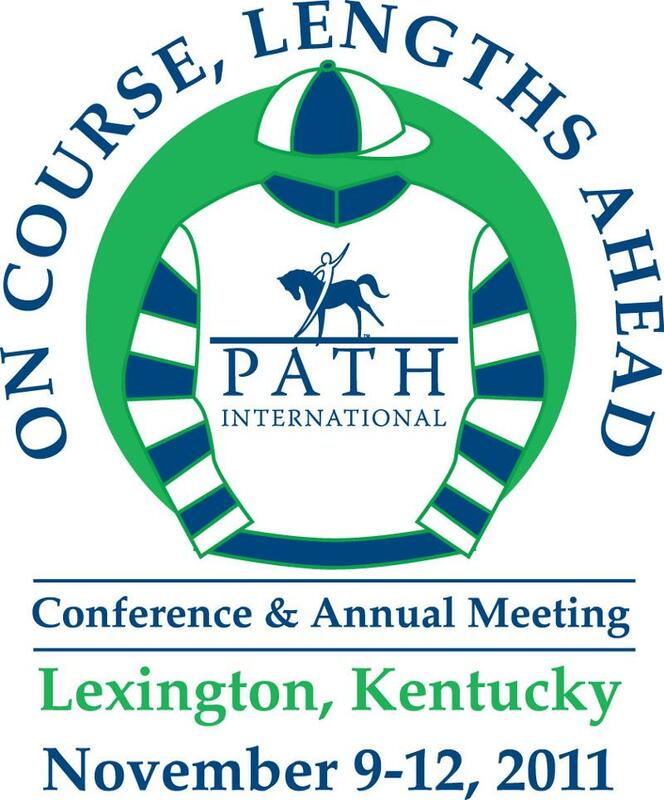 It's wonderful to see so much excitement about being a part of this association, and we know that excitement will spill over to the 2011 PATH International Conference and Annual Meeting - our first conference as PATH International. While most of the responses have been positive, we did hear from a center about the financial impact of the name change on centers. A few tips are listed below to help your center and your students as well as your community navigate through the name change. 1. Do a full audit on what your needs are and what you currently have on hand. Prioritize your needs according to your budget, your financial resources and your human resources. 2. Issue a press release about the name change and ask for patience during the transition. We at the national office are still finding things that need to be changed. It's a long process with many parts! 3. Only print new items as supplies are exhausted. We recognize that it is perhaps more professional to change everything all at once. But we also recognize that that's impossible in this economy and with the nature of the work we do. Again, we stress, exhaust your supplies first, and replace them with the new name as needed. 4. Talk to your printers and see if they would be willing to make a donation of print work. 5. Check with your volunteers and people in the community to see about website changes and updates. Remember, your youngest volunteer might be the best! These are just a few ideas to help get you started. If your center has other ideas or has done something that was particularly helpful, we'd like to hear about it! Send us an email. Post it on Facebook (and make sure to "like" us there!). Let other centers know what you have found that works. As always, thank you for making us a great membership association, and thank you for your patience! In June, I attended the American Horse Council (AHC) Conference in Washington, DC. The AHC represents the horse industry in Washington. The meetings were very informative. All breed births are down as are registrations and transfers of registrations (meaning, new owners do not register). Statistically, the breed birth numbers are closer to 1980-90s figures. There are concerns within the industry that there will not be enough horses for demand. Small regional horse shows are suffering while the major horse shows are doing well - the best horses are being imported from Europe. On the other side of the issue, the Unwanted Horse Coalition currently lists 170,000 unwanted horses. It started a program called Operation Gelding that provides gelding services at greatly reduced rates. The AHC, with the help of Dr. Jerry Black, DVM, at Colorado State University, is developing a National Equine Health Plan to protect equines at shows against health threats such as the recent Equine HIV outbreak. Throughout these meetings, representatives of the different breeds approached me to say they have horses available for our industry. PATH International is working with some of them to determine how best to get this information to PATH International members and centers. I'll let you know as we progress. Greetings EFP and EFL Community! Reading the 2011 PATH International Conference brochure nearly brought tears to my eyes. On every page there is evidence of the blossoming inclusion of EFP and EFL throughout the association as a whole. I thought about all of the hard work, passion, and energy so many people put into making this integration happen and I wanted to take a moment to thank the visionaries and the hard working volunteers who made this possible. First, I want to thank the PATH Intl. staff and the Board of Trustees for their complete support, without which we simply would not be where we are. Second, I want to thank Trish Broersma and Miyako Kinoshita as well as all the EFMHA board members whose leadership and vision enabled us to get here. Finally, I want to thank the EFP/L Membership Task Force whose dedication and hard work has surpassed all of my expectations. Together we did this! Take a moment to revel in the beauty of true integration! Every member plays a part in making this an invaluable whole!